Looking for a holiday cottage in April? If you can only see Fenil available and you are a group of 4 or less, give us a call and we will give you a quote. Book the farmhouse, normally our B&B, for a self-catered break. Sleeps minimum 8, in 4 bedrooms with 3 bathrooms. Sleeps up to 3 extra people. Enjoy the wood burning stove in the farmhouse kitchen. From 160€ per night, minimum 3 night stay. Please email us on [email protected] to book. This offer can only be booked by sending an e-mail. Planning ahead? 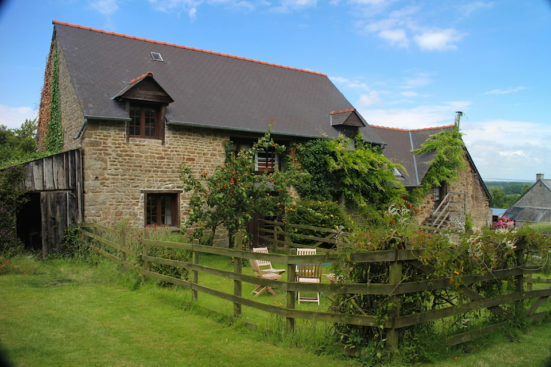 Book the farmhouse self-catering for Christmas and New Year for 1000€. Arrive on 24th December and leave on 2nd January. Logs provided for the log burner in the kitchen. If you are interested in a long-term let over the winter, do send us an e-mail, and we will see what’s available around our maintenance plans for the winter. Le Parc Botanique de Haute Bretagne – a hidden gem. Breakfast at la Ferme de la Baie – petit déjeuner pour vous?